2013 and 2014 marked the 45th anniversary of the first performance of the play Les Belles-sœurs (1968) and the 30th of Albertine en cinq temps (1984), the 40th anniversary of the plays Hosanna and La duchesse de Langeais and of the novel C’ta ton tour Laura Cadieux (1973) and above all, it marks the 35th anniversary of the publication of La grosse femme d’à côté est enceinte (1978), the first of the Chroniques du Plateau-Mont-Royal, a series of popular works of fiction. It was therefore inconceivable to overlook this opportunity to pay tribute to novelist and playwright, Michel Tremblay. 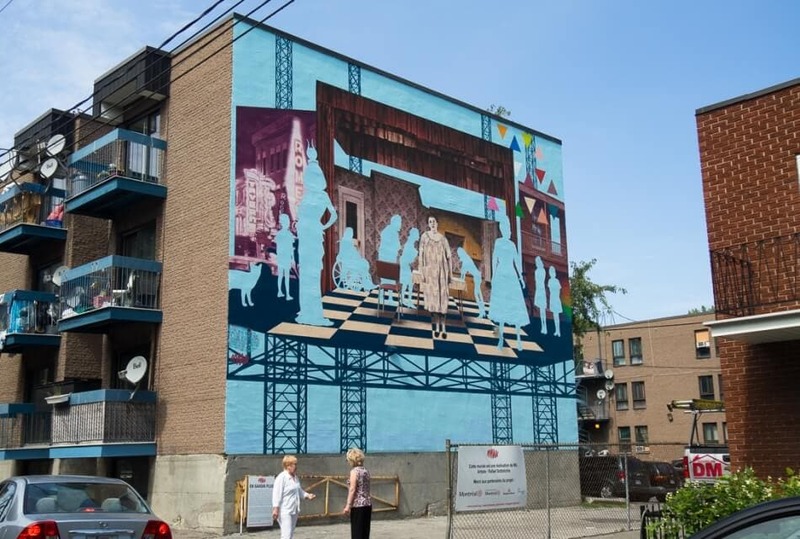 Directly inspired by his body of work, the mural celebrates Tremblay’s invaluable contribution to Quebec literature as well as the quintessential Montreal borough on which he shines a spotlight: the Plateau Mont-Royal. The artwork presents several characters from Tremblay’s imagination : Marcel Duplessis and his cat, Albertine, Thérèse and Pierrette, all from the Chroniques du Plateau-Mont-Royal; Hosanna, and of course, the Belles-Soeurs: Olivine Dubuc, Rose Ouimet, Marie-Ange Brouillette, Pierrette Guérin and Germaine Lauzon who gave her name to the mural. The mural is part of a series entitled Hommage aux bâtisseurs culturels montréalais initiated in 2010 to highlight the contribution of the creative minds and forces behind Montreal’s reputation as an exceptional North American city. Since the launch of this ambitious project, a series of murals have been created to pay homage to the creative talents who have made outstanding contributions to the local, national and international reach of the city’s cultural scene. Free mural arts workshops have been offered to neighborhood youths aged 13 to 17, in collaboration with Place aux familles organization.